For the third consecutive year, I have had the privilege of working with LonAire Flying Service Inc. of Miles City, Montana, most recently in August during the Oak Flat fire west of Grants Pass, Oregon. Fires in the Pacific Northwest are typically large in comparison, due primarily to the extremely rugged and inaccessible terrain. Combine the topographical features along with that of the smoke inversion and lack of visibility, and you have the prime ingredients for an aerial disaster. As a contractor, Mr Leslie provides an air tactical platform with state of the art technology along with a truly skilled and professional pilot, to meet the requirements of a critical and very demanding position over these fires. As “eyes in the sky”, the aerial platform is asked to, and some times required to fly in almost zero visibility, while maintaining a presence and communications with people on the ground....the sole purpose being, safety to those ground forces working in the close proximity to the fire. For the second year in a row, Mr. Leslie has raised the bar to new levels for other contractors to follow. The season of 2009 was the first ever Infrared system installed on a Call When Needed aircraft, and the ability to send pictures of the fire by way of electronic devices. For the 2010 fire season, Mr. Leslie made available a Gimbaled Infrared system capable of locking on targets, zoom, Latitude and Longitude display, recording, and most importantly the ability to transmit live video to ground personnel. Fire managers for the first time, could view the fire and make tactical decisions based on actual and real-time videos. As an Air Tactical Group Supervisor the state of the art technology provided by this aircraft and this company, has given me the ability to do my job at a previously unheard of, and unprecedented levels of safe, effective, and efficient service to aerial, as well as, the people on the ground. I look forward to working with LonAire during the summer of 2011 and beyond. If there are questions regarding the use of LonAire as an air tactical platform, please feel free in contacting me anytime. I can be reached by cell 530-598-0821. The added capapbilities of IR camera and the ability to fly at night and see through inversions layers was essential in our success at reducing acres burned, thus reducing the over-all cost of the fire. We were able to detect and safely deploy resources on spot fires that we otherwise would not have detected until the following operational period. In addition we were able to cost/share with other fires and forests due to the aircrafts ability to fly extended shifts/fly at night during IA and get an accurate size-up and resources needed to control their fires. The air attack platform exceeded my expectations with the ability to extend customary air attack shift lengths. With the addition of a second pilot we were able to fly early in the mornings for fire status and mapping missions, giving updates prior to deployment of resources and to validate the tactical plans for the operational shift and to fly into the night time hours during critical burn-out operations and extreme fire behavior conditions. LonAire is a top notch company with professional owners/pilots and well maintained equipment. They have proven their desire to provide a quality platform as well as made large capital investments in the IR cameras and recording equipment. They work well with the IMT and NIFC in the development and utilization of state of the art elctronics. This company is setting the agency standard for air attack platforms. Lonnie is a class act, professional in every aspect of the mission and a pleasure to work with. He is a team player and is always striving to meet all the requests and needs the IMT asked of him. As an Air Tactical Group Supervisor (ATGS) for the Oregon/ California Incident Management Team (ORCA), I was recently afforded the unique opportunity to test the state-of-the-art technology and equipment while assigned to the Oak Flat fire on the Rogue/Siskiyou National Forest from August 15 – September 7, 2010. In the Call-When-Needed (CWN) world of aerial supervision aircraft, the tactical “bar” has been set by LonAire of Miles City, Montana. The aircraft in mention is N47TT, a Turbine Jetprop 840 Twin Commander, owned and operated by LonAire. The fire season of 2009 saw N47TT as the first and only CWN aircraft with forward and side-looking fixed Infra Red cameras, taking the air tactical platform to new standards of aerial firefighting. We could now see through the smoke and better aid the firefighters below. It did have its limits however, being that it was fixed, and therefore the pilot would have to aim the cameras by flying the aircraft in a constant right turn. This evolution was not favorable to the nighttime flying requests, as point of reference and horizon would be lost in the darkness, making it difficult to maintain coverage during critical nighttime burnout operations. During the fire season of 2010 and specifically the duration of August 15 to September 7th on the Oak Flat fire, a new Infra Red camera was being used. A retractable, Tase Duo Gimbal camera had been installed and was being utilized for the very first time on this incident. The Tase Duo provides a full featured gimbal control, allowing for 360 degree rotation and 180 degree horizontal movement. Basically, a target could be locked and the camera would track that target, regardless of the aircraft movement or position. This in itself allowed for the safe, effective, and efficient use of the aircraft for the nighttime mission. Additionally, with object tracking, scene tracking and geo pointing, specific locations targeted could be read out by latitude and longitude, affording reasonably accurate coordinates to ground personnel. Of particular interest, we were able to locate a spot fire, determine its location, effectively plot on a map, and then relay this information to the fire managers, all under the cover of complete darkness. As it turned out, the spot fire was well outside the perimeter control lines, and had it not been detected that night, it could have jeopardized the control efforts for crews in the daylight hours. Could we have done this with the fixed IR cameras...probably yes, however the safety of that mission would have dictated that we not fly that late at night. Also, the accuracy of which we were able to pinpoint the exact location could have been severely compromised. Also during the Oak Flat incident there was another technological advancement that I was fortunate enough to test, that of a real-time video down link. We were able to send live video of the fire, the burn out operations, or an overview of the entire fire area, in Infra Red or color camera. Various fire management functions were able to view the fire by internet access and proper password authentication. Several late night burn out operations were documented with live down linked video streamed to the Operations and Incident Commander for strategy and tactical decision making. By way of a discreet radio frequency, a narration of the burnout progression while watching the video afforded those managers a complete overview of portions of the fire, or the entire fire area during those decision making meetings. Of particular interest, we were dispatched some 20 miles to the south and west of the Oak Flat fire, to IR and to map a new fire called the Cedar incident. We were able to transmit a live video feed to the Rogue Siskiyou Fire Staff, and as a result of that live video; the fire staff did in fact cancel the mobilization of another Incident Management Team which they felt would have been necessary to mitigate the new fire. The cost savings for that “no-mobilization” alone justified the video link. As with all things new, there are great things, as well as.... call them glitches, pros and cons if you will. I think I have accurately described those things that were “cutting edge” great. Things that made this air attack platform unique, more so than any other aircraft available in the CWN world. The only downside to the IR camera was that the mapping software wasn't really compatible with ground maps or detailed enough for the job we required of it. We never really realized the camera's full potential somewhat in part because of the lack of those maps. The success of the video down link was just that...a tremendous success, but if I were to identity the only “problem”.... putting it into perhaps the A- category, would be the slow frame rate output as seen by the viewer. The video was spectacular, but could have been perhaps more in line with the “real time video” effect, had it been at acceptable real time speeds. None-the-less, it was a “walk on the moon” and I felt the application was a tremendous addition to the completion of my job. I would have loved to have seen the video with the ground receivers in place. Something else to consider....we might not be so fortunate as to have cell coverage the next time. In closing I would just like to say that it was a privilege for me to participate in what could be termed as “history in the making”. Things that have never been done in the CWN world were done in a manner consistent with safe, effective, and efficient mission objectives. The bottom line is we made it better and safer for the folks on the ground. If you have any comments or concerns regarding this letter, please feel free to direct them to me personally, or by phone. I can be reached by cell, 530-598-0821 anytime. This aircraft provided valuable and timely service. The IR capabilities of this aircraft were critical to control operations on the ground. We used the IR capabitities for spot fire detection under heavy smoke inversions, for aerial observation of a PSD mission which allowed us to see thru the forest canopy and see the ignition lines and patterns of the spheres as they ignited and determine future firing patterns and depth. We were also able to determine depth of the burn-out operations as it was critical to the safety of fire fighters, strength of control lines and was a high priority to agency administrators as it related to turn-back standards. We were able to receive real time photos of actively burning areas from the aircraft to ICP which aided in the tactical decision making process. Another great feature of this aircraft was operational recon platform during critical burn periods and burn-out operations. Lonnie was very professional as an air attack pilot and was able to perform air attack duties during multiple aircraft operations. All equipment operated as expected and was in excellent condition. I am not usually one to give an outstanding rating to anyone, unless it’s truly deserved. Lonnie Leslie has put together an aircraft that is far superior to any others that I have worked with as an Air Attack platform. It is the high-wing twin engine turbine commander which has a great view for the ATGS. He has the a great radio package, GPS and TCAS. He has the trainer position in the back with full use of the radios. He has a video camera that is continually recording the view out the right side. He also records all audio and video on DVD’s to share with the ATGS and ATGS (t) to help improve their performanace and also to identify for himself any areas needing improvement. This year he added two infrared cameras, one forward view and one that points out the right side. There are two flat panel screens in the aircraft that allow the pilot and all passengers to see the infrared video. These cameras allow the ATGS to see through the smoke to the ground and add a new dimension of safety for ground resources that has not been available until now. The ATGS can be above a smoke covered portion of the fire and give ground resources updates on conditions. During the Williams Creek Fire, using the infrared cameras, Lonnie and Tom Bagwell (the ATGS at the time) picked up spot fires and directed ground resources into these spots. Had this technology not been available these spots would have gone unnoticed until they were too large for the ground resources to handle. This technology helped to keep the fire small and within the containment strategy saving suppression costs and the loss of State, Private and National Forest resources. I’m sure that Lonnie is someone that will continue to evaluate and improve his skills along with continuing improve and update the equipment on the aircraft. All firefighters need to be prepared and ready to respond. Lonnie is a committed pilot/firefighter. He keeps himself and his aircraft in a condition that is ready to respond. Lonnie is always thinking ahead and preparing for the next day, shift, etc. He is on-top of any issues that may come up to get them resolved as soon as possible. Lonnie is the owner/operator for his aircraft. He is an excellent pilot and manages his time very well. He let us know well in advance when he would require time off so that plans could be made. Any mechanical or technical needs, he made arrangements to get the service done without impacting our operations. LonAire Flying Service provided an air attack platform, 47TT, on the Williams Creek Fire (Umpqua National Forest) during the dates specified above. The aircraft provided was very high quality (power/manueverability) and contained some state of the art technology dealing with infrared cameras and capability to link photos back to the Incident Command Post for the Operations Group Supervisors. This technology allowed us to look through the smoke to observe current fire behavior and location along the perimeter. This information was invaluable in being able to make real time decisions concerning tactics and fire fighter safety. In addition, this aircraft was outfitted with the radio configuation in the backseat to accommodate having a Air Attack Group Supervisor trainee on board and giving them an opportunity to gain “hands on” training. The aircraft’s radio set-up allowed the trainee to also gain front seat experience while providing the trainer the capability to take over if necessary from the back seat. This resulted in a unique training opportunity that does not occur with most contracted aircraft. Additionally, Lonnie was highly skilled providing the Air Attack Group Supervisor (ATGS) the best vantage point from which to observe the fire without compromising safety. He communicated very well with the ATGS and, as the incident progressed, one could observe the two working as a team to coordinate the movement of the air resources. I had the opportunity work with Mr. Leslie for approximately six weeks in Northern California during the 2008 fire season. 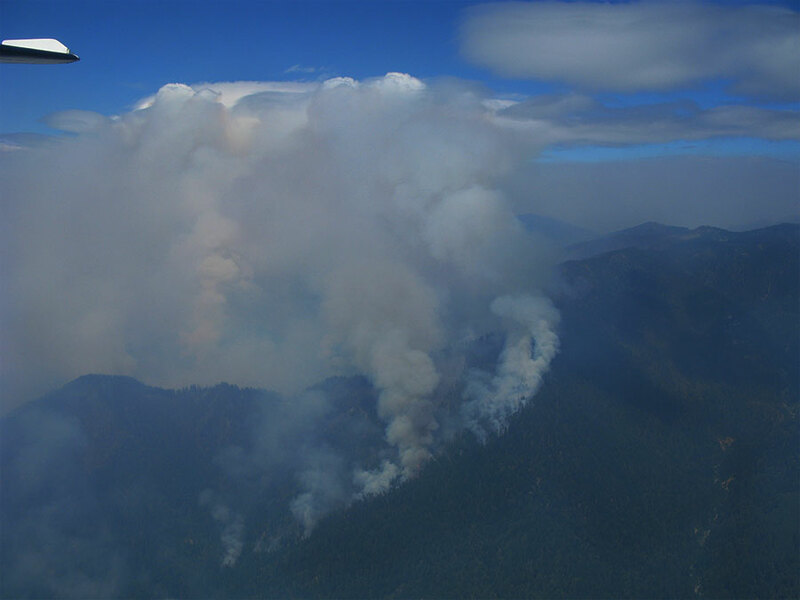 At that time, several hundred lightning fires erupted throughout the state, and as a result, much of Northern California remained blanketed with heavy smoke from June 21st to well into September. To put this into some form of perspective, the airspace over an incident is fast moving, dynamic and terribly unforgiving of mistakes. Couple this with limited visibility due to smoke and unfamiliar terrain, one could understand the complexities involved with piloting an aircraft under these conditions, all the while doing so with the utmost safety concerns as paramount. The aircraft Mr. Leslie owns and operates is a very reliable a safe, turbine powered twin engine of high wing configuration, which lends itself to be a most effective platform suited for aerial firefighting. The visibility issues alone make this aircraft highly sought after, however Mr. Leslie has gone beyond the minimum contractual requirements and made this particular aircraft a one of a kind. Contractors typically supply only the required two VHF-FM fire radios, Mr. Leslie has installed four. There is a complete radio and audio panel configuration at the rear seat to allow for Air Tactical Group Supervisor (ATGS) trainees to participate in incident tactical decisions. Many of the Call When Needed (CWN) aircraft do not have this capability. Additionally, video cameras and audio recorders capture the radio traffic as well as tactics on the ground and in the air. At the completion of the shift, a DVD is given to the trainee so that he or she can review their progress. To the best of my knowledge, this is the only aircraft with this capability. Mr. Leslie and I were over an incident in which a firefighter had become trapped and as a result, succumbed to the fire. A complete record of what had transpired while we remained over the incident was presented to the accident investigation team. Without these visual and audio recordings, valuable information would have been lost. An aircraft is only a good as the person who flies it. The ATGS and the pilot must become a team, relying on each others skills to mitigate any of the many tactical problems and decisions they are faced with during their shift. Mr. Leslie has been flying for decades and has many years of aerial firefighting experiences to draw from. Additionally, Mr. Leslie constantly displays one of the most unique and highly desirable trait, that of a true professional. I believe I have shown the reasons for my highest ratings of Lonnie Leslie on the attached evaluation form. During my twenty eight year career as an Air Tactical Group Supervisor I have been very fortunate to work with some of aviation's finest. No one however, exhibited more of that special trait of teamwork, professionalism, and friendship than Lonnie Leslie. I remain available for any questions or additional comments you may have. Please feel free to contact me anytime day or night at my residence or by cell.